Relax is primarily comprised of amino acids, vitamins and minerals (inositol, nicotinamide, l-tryptophan, calcium, Vitamin B6, Vitamin E, Zinc, Selenium, Vitamin D3). The amino acid L-tryptophan is a precursor of serotonin. This is a neurotransmitter that controls sleep patterns in the brain and so induces a calm and relaxed state rather like the feeling associated with the ingestion of a large meal. Inositol (Vitamin B8) is a B complex vitamin that aids in maintaining healthy cell membranes, especially the cells of the brain and bone marrow. It is involved in a second messenger system in the brain. Inositol helps to promote reverse de-sensitisation of serotonin receptors in the brain thereby helping to reduce various anxiety states. 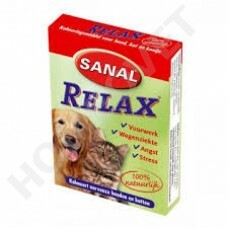 Relax has a mild sedative effect depending on the dose rate. It does not produce the level of sedation associated with stronger tranquilliser drugs. It generally lowers the metabolic rate and the animal appears calm and relaxed. However, if the animal is stimulated with activities such as going for a walk then the state of relaxation will be reduced. Because Relax contains a blend of amino acids and minerals, long-term treatment is not an issue. However, it is still advised that once the behavioural problem in the animal has either been reduced or has ceased, the Relax 'therapy' can be withdrawn. May Relax be given to pregnant cats/dogs? Relax is a safe product with a wide safety margin and has no major effect on blood pressure, which is beneficial in a pregnant animal. However, any medication administered during pregnancy should have its dose rate reduced to avoid any effect on the pups or alternatively on the milk. Relax has been used in pregnant dogs without any problems, but any medication used during pregnancy needs to be monitored as every animal is different. These precautions should be applied throughout the whole of pregnancy. May Relax cause an addiction? Relax contains only natural ingredients thus its safety profile is increased and works on natural pathways in the brain. Relax is used mainly for serotonin responsive problems such as various anxiety states or aggression - either on its own or in combination with behavioural programs such as clicker training. Relax does relax the animal but it does not compromise the conscious state of the dog or cat. This is in contrast to stronger sedative medication where the dog/cat is sometimes left without being able to do anything. The natural ingredients contained in the product have not been related to any form of addiction or dependency. As some dogs have intractable behavioural issues this may require prolonged therapy - and this must not be confused with dependency. In contrast, Valium is an example of a sedative drug given to animals that is related to long-term addiction. May Relax be given to cats/dogs with heart problems? As regards its use with heart problems, Relax helps to calm and relax the dog or cat without effecting heart rates and blood pressure significantly. This is also of benefit in heart related problems and also during pregnancy. Other medications can induce hypo-tension and variations in heart rate or rhythm that could counteract concurrent medication for a heart ailment. When the dose does not work, may the cat/dog be given more tablets? As regards increasing the dose, some dogs prove refractory (‘resistant’) to normal amounts and often the dose is tapered higher gradually until the desired effect is seen. This is normally achieved even in problematic cases at twice the normal dosage, but some dogs may require a large bolus effect initially. If this is a requirement, the dose should gradually be reduced to normal levels for maintenance once the animal is stabilised or conditioned. Also it sometimes takes a few days for Relax to gain its full effect. If the medication has not reduced the problem after 30 days then a more suitable alternative may be required. Some pet-owners often use large doses to treat a problem that may actually require other approaches such as behavioural modification. However, while Relax will help the problem, the dog or cat should also receive proper training to ensure a lasting cure. Any other diseases that may cause problems together with the use of Relax? Other problems that may affect the use of Relax would be if similar concurrent medication were being used. Examples of such medication include tricyclic anti-depressants, monoamine oxidase inhibitors and others. These are mood altering drugs also used for various behavioural problems and generally should not be used together with Relax. Other problems may include end stage liver disease where the animal’s ability to detoxify even normal products is compromised, or if suffering from symptoms of encephalopathy or dementia. Some people often use Relax for epilepsy in combination with either phenobarbitone or potassium bromide without any problems as it may help to further increase the seizure threshold. If the dog or cat is suffering from enteritis or any major intestinal upset, then the use of Relax should be avoided as it may aggravate the condition. Use of Relax can begin/continue once the problem has ceased. The benefit regarding Relax is that long-term use does not predispose to liver and kidney problems as opposed to long term anti-convulsant or anti-psychotic medication such as those listed above. May Relax also be given to small animals such as rabbits? What is the dose for those animals, depending on weight? There should not be any problem associated with the use of Relax in rabbits, again due to the natural ingredients it contains. It would have a better safety profile for use in these animals by contrast to other medications. The dose rate would depend on weight, but as a general guide a similar dosage to cats should be applied.